For Ben Gray, the “golden hour” is his time to run. The geometric silhouette of the skyline, a costumed mascot leaving a hotel lobby: he captures the simplicity-and oddity- that you’ll find just before the sun rises and sets. Gray himself is a character. He’s not hard to miss with his platinum hair and twisted mustache that twirls out into two perfect curly Q’s. He is a man taken by inspiration. 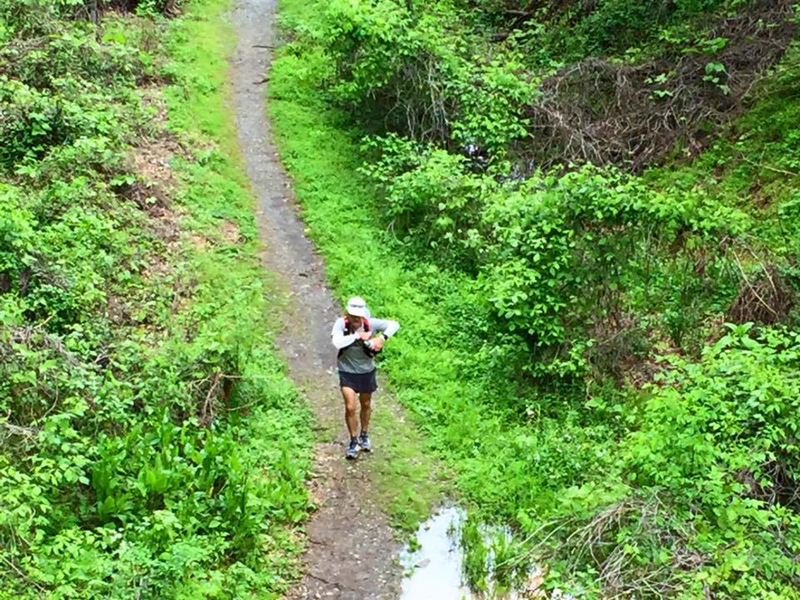 He thought running looked fun, and in two years, he's gone from an award-winning photojournalist to a passionate ultra-runner. Gray is the pioneer of #runography, the hashtag for his Instagram account @photobgray. A scroll through his photos offers a glimpse into his personality, with explanations that make you laugh just as much as the photos he’s captured. Here, we delve a little further into the life of Ben Gray. How did #runography come about? As a professional photographer, I wouldn’t shoot photos outside of work. I’d think, what am I going to do with this? It’ll just sit on my hard drive. 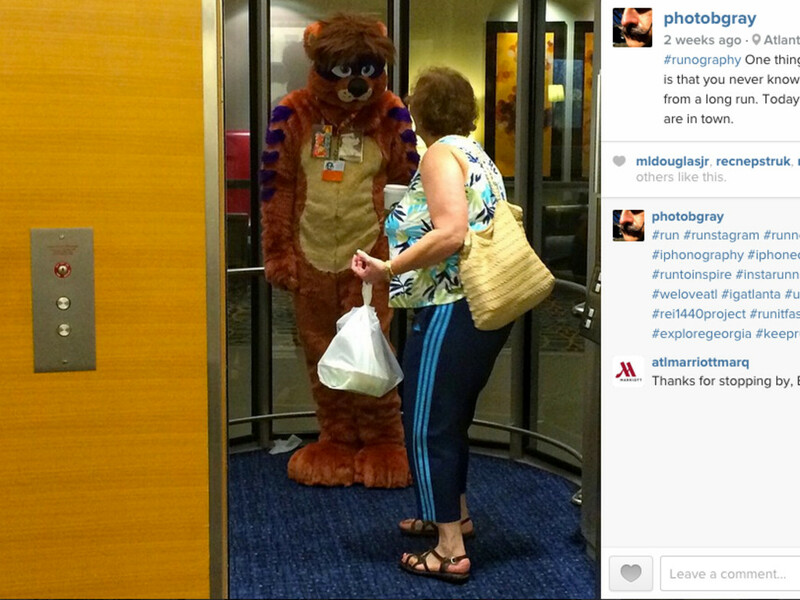 But Instagram gave me a reason to share my photos. I always found interesting scenes on my runs, so last year on March 26, I shot a photo and decided to create a daily photojournal. Thus, #runography was born. What shots do you look for on a run? I look for street photography—the shots that are kind of ironic. I guess it plays off my sense of humor, or it comes from the altered state of mind I have when I’m running. This a perfect example. 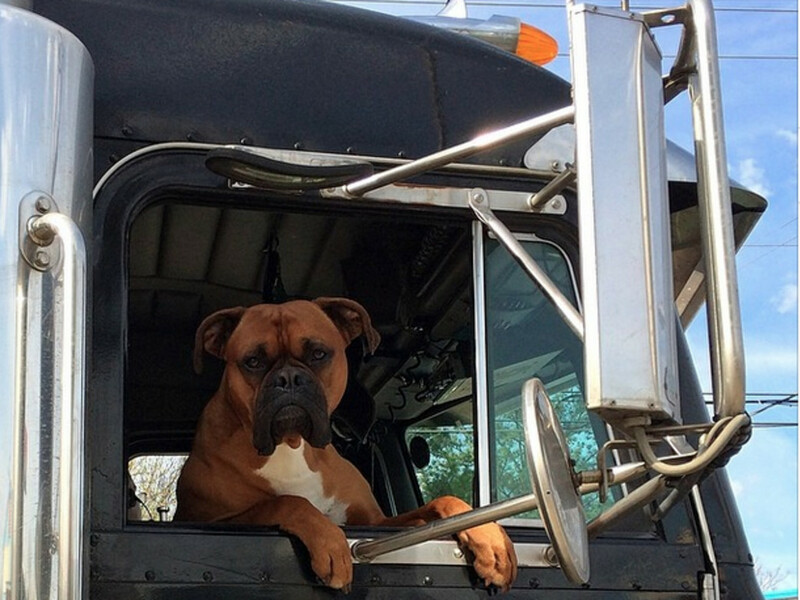 Just a truck with a boxer hanging out of it. 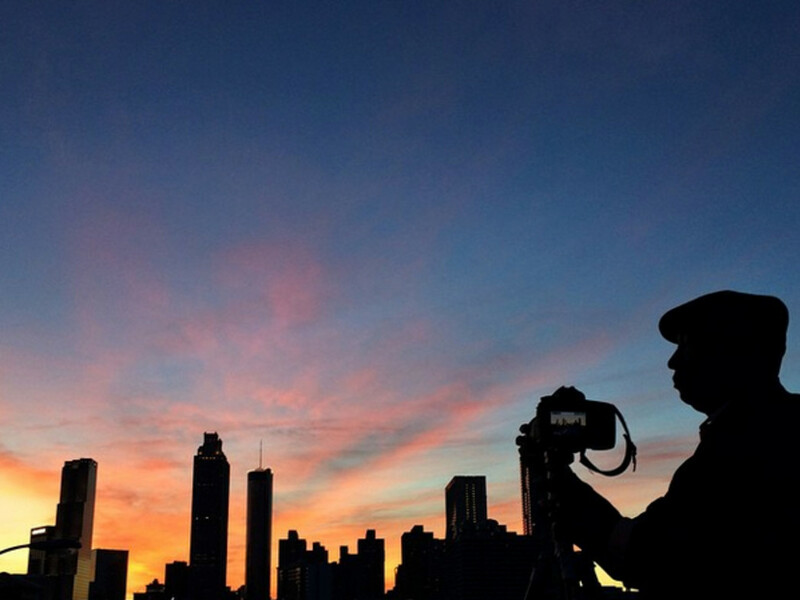 This photo was shot off the bridge at Peachtree Street. 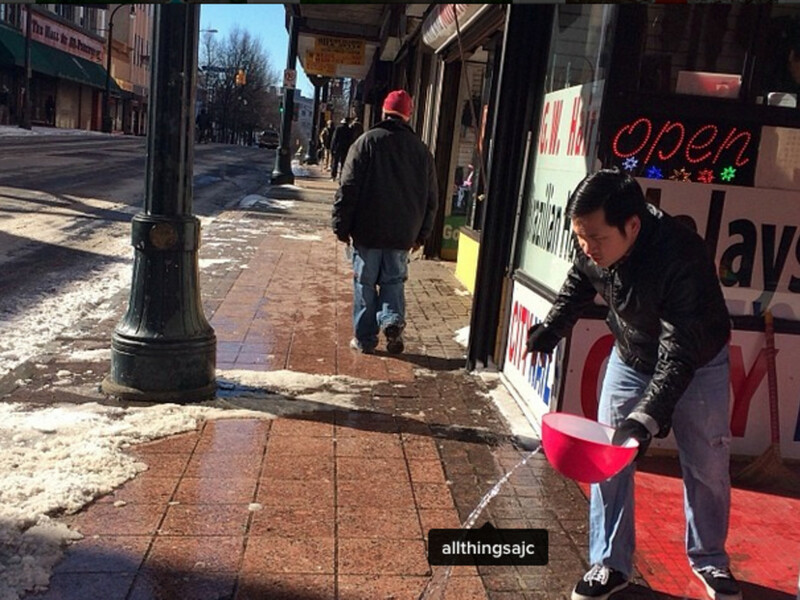 What are your favorite Atlanta spots for good photos? My neighborhood of Castlebury Hills should be a rich area for photos because it’s so artsy. But I run through there multiple times a week and have never gotten a good shot. There’s not one particular spot I find the best photos, you just have to be on the lookout. Sometimes I’ll go on a 20-mile run and will only get one photo, sometimes it’s six miles and I come back with five photos. You’ve only been running four years, yet you’ve become age group competitive and have already completed two 100-milers. Sounds like you were a natural runner. I’ve always been active, but not much of a runner. I was always assigned to shoot photos of the Peachtree Road Race. I got the itch, so I ran the Peachtree. Within one year, I ran my first marathon, and eight months after that I did my first 50K. I competed in my first 100-miler, the Rock/Creek Thunder Rock just two years after I began running. Does #runography mess up your workout? I tend to run too fast on a training run, so it actually serves as a way to slow me down when I pause to shoot. If I am stopping more during a run, I know I’m getting good photos, and then the issue is that I run out of time and I’ll be rushed to finish my run before I have to leave for work. 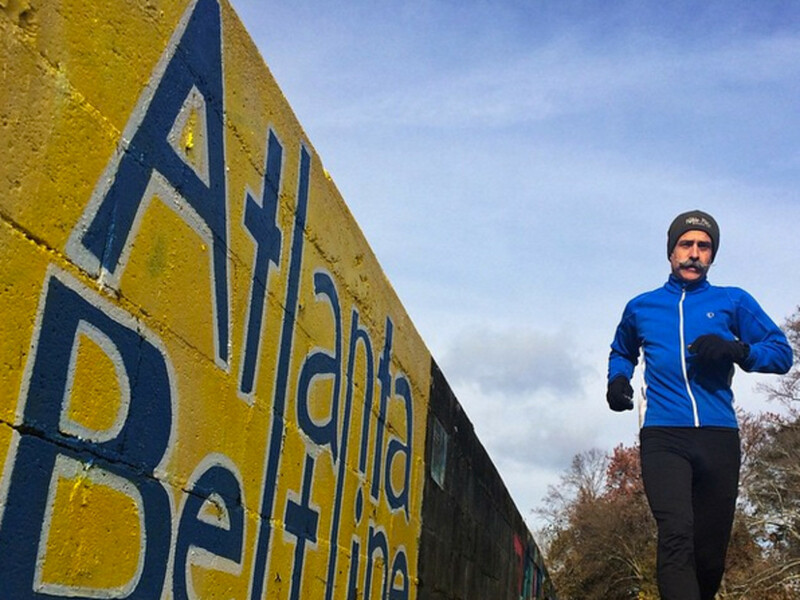 On the Beltline run, what did you discover? The coolest part was figuring out how the neighborhoods connect. 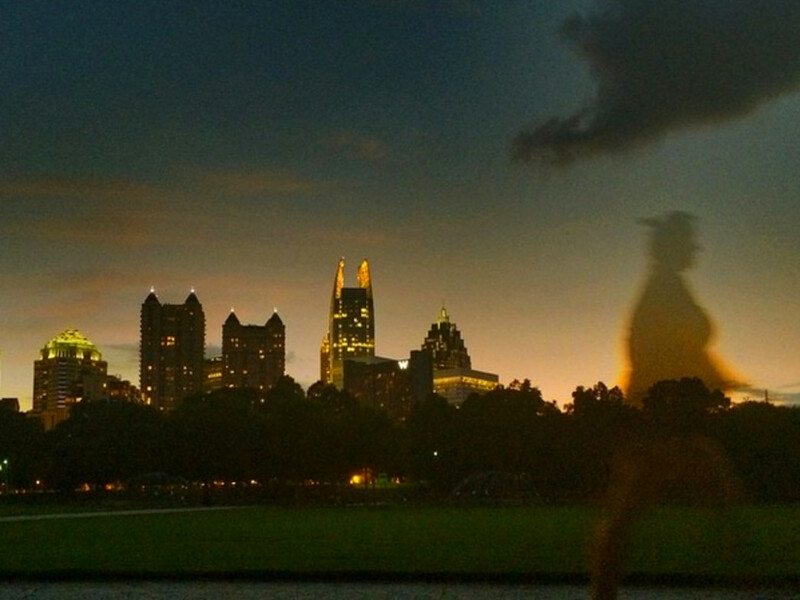 Atlanta is a little like New York City, where each pocket has its own personality and flavor. For instance, the Eastside trail section is paved; condos are going up on the sides of the trail, and it’s always crowded. Then in the West End, you see the history of where the Civil Rights movement in Atlanta took place. And that contrasts to certain parts of the Beltline that are industrial and barren. 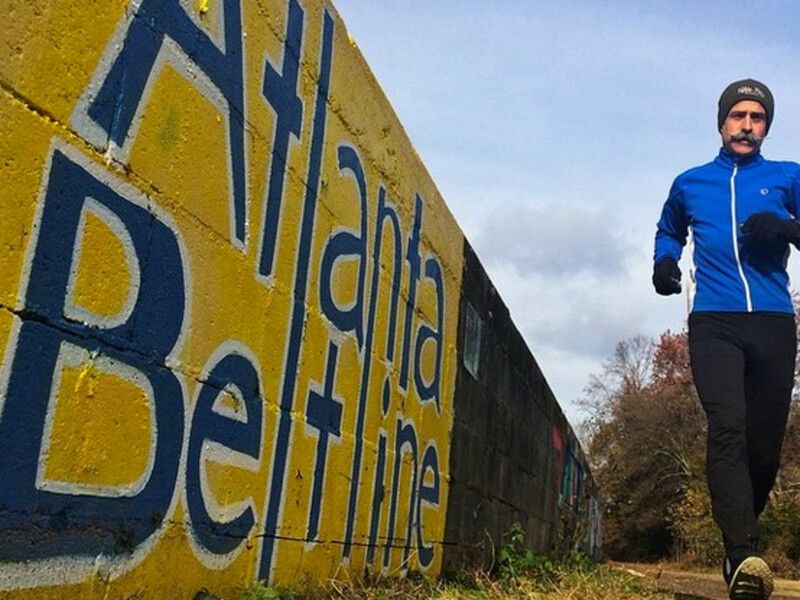 Atlanta Beltline Adventure from ben gray on Vimeo. 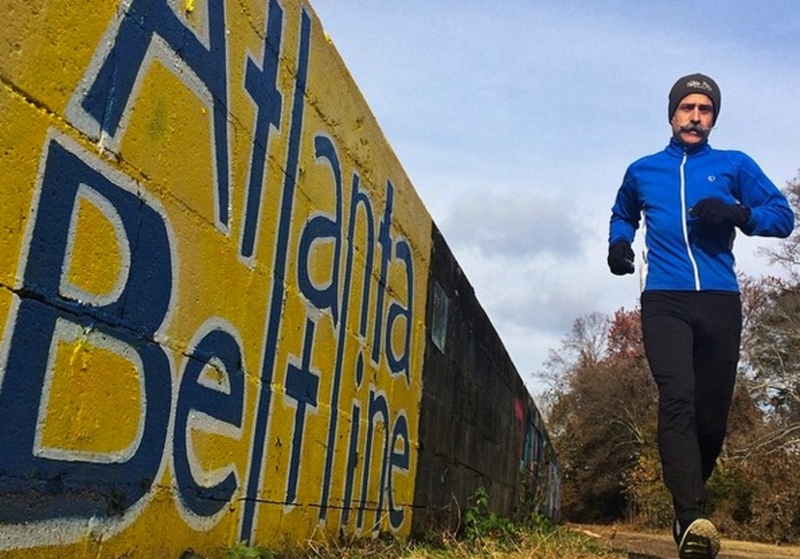 What is your favorite part of the Atlanta Beltline to run today? The unpaved section from Memorial Drive to Irwin Street. The railroad bed is marked and its an uneven surface, but when you come out after four miles, you’re right in the heart of Old Fourth Ward and at the paved section of the Eastside Trail. Are there other undiscovered trails in Atlanta that you’ve discovered by going off the beaten path? I just discovered the Morningside Nature Preserve. It’s great because you don’t have to map it out. The first time I went there, I ran in circles for several miles. I ended up in people’s backyards, under power lines, by a river… but I loved it. 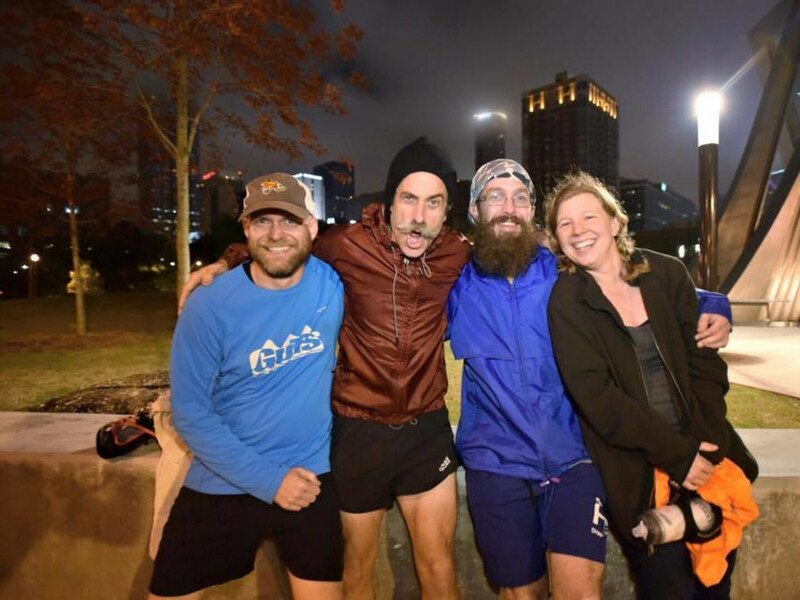 Gray recently completed the Great Southern Endurance Race, a 100-mile urban race around the city of Atlanta. A look at the map alone is enough to make your body ache with pain. At 5:18 a.m., the three race participants began their day on the top of Kennesaw Mountain. The weather forcast looked daunting the night before: 95 percent chance of rain from 5 to 9 a.m. 90 percent chance of thunderstorms from 11 a.m. to 3 p.m., but miraculously race morning turned overcast after 8 a.m., and the rest of the day remained rain-free. Author Alexa Lampasona joined Gray at mile 27.5 to bike alongside him. He chatted throughout the portion he was joined, while still logging 10 minute miles. 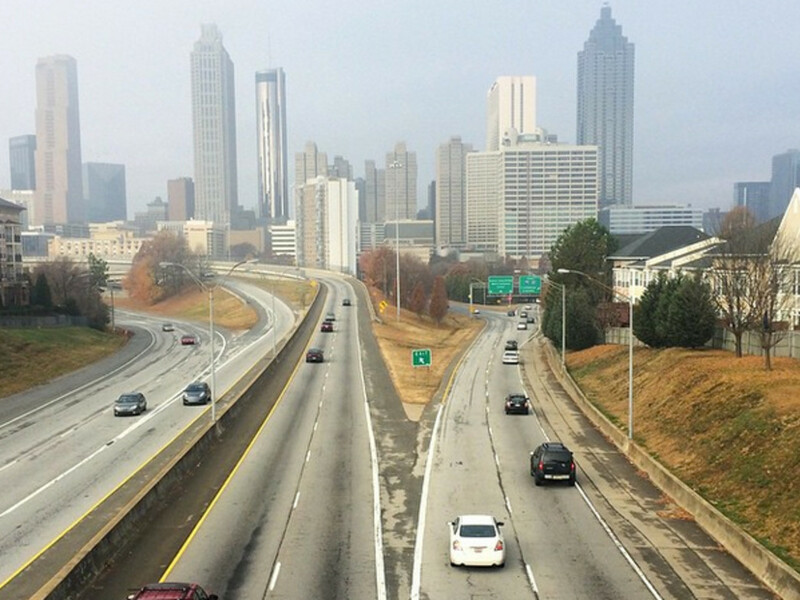 As Gray ran parallel to Piedmont Road he stopped abruptly and backtracked a few steps. Seconds later, he was climbing a four-foot brick wall to get a better angle so he could shoot a photo of a sign that quoted lyrics from a B.o.B. song. "This is the kind of stuff I love. You wouldn’t see this sign if you were driving. I’m more aware on my runs and it allows me to see things from a different perspective. That’s also why I don’t run with headphones. I become in-tune to the surroundings." From 32 miles, the race traversed Piedmont Park, followed through both rural and populated neighborhoods and climbed up and down the one-mile trail to the summit of Stone Mountain. At the mile 68 rest stop, Gray’s sense of humor was still intact. He slurped down ramen noodles and made jokes about the race course. This is the worst-marked course I’ve ever run on. I don’t know what the race director was thinking. (The race director was standing beside him.) Oh sorry, I didn’t see you there. The last leg for Gray led him from Decatur to Brookhaven, for the final stretch that followed the Peachtree Road Race course. The race ended by Centennial Olympic Park. 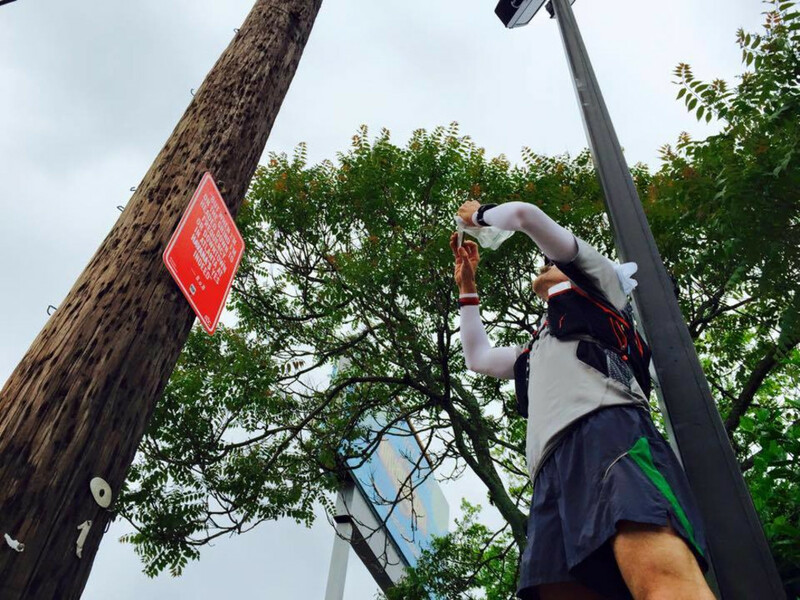 Gray completed the race, which ended up being 103.13 miles, with a time of 23:03 and a pace of 13:25 per mile. Ben Gray has worked in photojournalism for more than 20 years and is currently the evening news multimedia photojournalist at Atlanta Journal-Constitution. You can see his portfolio of work on his website: bengray.com. He prefers to use the hashtag #runography to share his photos, but encourages others to tag his @photobgray when they snap a photo on their run.